Cleaning your windows takes you a too much time and exhausts you? You can make a change now – just call our representatives and book our window cleaning in West End. We will handle this matter for you and the final result will be appropriate for all parts of your windows – glass surfaces, frames and sills. With our assistance, you will have the flexibility to do everything you want with the time you usually spend for window cleaning. But our services will bring you even more, as you can see from our list of benefits. We also provide our professional services in nearby areas: Soho, Covent Garden, Tower Hill, Blackfriars, Fenchurch Street. The employees have the skills and the needed equipment to provide you with both residential and business window cleaning. You can rely on us for all types of glass surface cleaning. For example, we can polish small or double windows, French doors, sash windows, bay windows and patio doors. In addition, if you have garden glass surfaces, greenhouse or skylights, we can clean them too. We use the most progressive ways and the most advanced equipment for all the previously mentioned window types. You can be sure that the good look of your commercial building is certain. The professionals will provide you with top-notch commercial window cleaning. With the help of our water-fed extension pole system, you will receive swift and excellent washing of all windows as high as the fourth floor. For high-rise buildings, we employ our rope access gears. It is our efficient method of reaching glass panes on taller buildings. No matter what is the size of your property – a humble corner shop or the Shard – we will ensure great look of your windows. We use the most advanced techniques to be sure that you get second-to-none window cleaning. With our water-fed extension pole cleaning system and high pressure cleaning technique, you will enjoy crystal clear look of your windows. We attach our poles to water reservoirs in our vehicles to ensure that there is no risk for the exterior of your dwelling or business building. For high-rise windows, we utilise entirely secured rope access approach. You can profit from these cleaning techniques now – just ring 020 3746 3113! 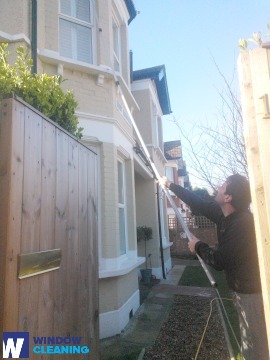 With our speedy and effective residential window cleaning in West End, you will improve the look of your home at once. We utilise purified water for inside and outside cleaning of your windows. We make this possible by standing on the ground with the help of water-fed extension pole system, which is safe both for your home and the cleaners. Learn more – call us on 020 3746 3113 or fill in our online booking form. For your convenience we have a chat alternative. Our representatives are active 24/7 – you will get answers to your questions. You can be one of our satisfied customers today!